"The thousand-year-old "abbey of good culture" has belonged to the Giuntini family, now Stucchi Prinetti, since 1846. Its name literally signifies the abbey's role in Western European cultural history as a place of worship and spiritual refuge as well as a center of learning and agricultural laboratory. challenge is to maintain the integrity of Sangiovese and Chianti Classi- co's unique terroir through organic farming practices, clonal diversity, restrained use of new oak and excluding nonindigenous grapes. Coltibuono's estate includes a B&B and apartments for farm holidays, a restaurant, a culinary school and is open for visits and tastings. 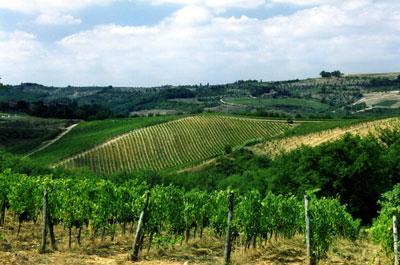 Vineyards and Vinification: The estate is situated on the Chianti region's highest hills. Total acreage is 2,282: 180 vineyards and 44 olive groves. After ten centuries of uninterrupted agricultural tradition, all Coltibuono's estate grapes are now organically grown, and vinified using natural yeast. The first leading wine-producing firm in Chianti to wholly return to environmental sustainability, Coltibuono is also dedicated to the preservation and vinification of Sangiovese, producing three different Chianti Classico wines and one IGT wine exclusively from Sangiovese. Their new, architecturally arresting and technologically innovative winery has minimal environmental impact and uses gravity flow, manual grape sorting, gentle conveyance of de-stemmed fruit to the fermentation tanks, smaller size vats for separate vinifications, a piston cap punch-down system, native yeasts and mostly maturation in casks over small barrels. The estate also produces a line of "Coltibuono" wines, made from grapes selected from small growers in Tuscany." James Suckling 88"Aromas of cherries and dried berries with hints of lemon. Medium body, bright acidity and delicious fruit. Nicely done considering the difficulty of the vintage. A blend of sangiovese and canaiolo." Drink now. Vintage notes "The 2013 vintage has been a longer and cooler growing season compared to recent years. The harvest lasted until late October. The wines show good concentration, perfect maturation paired with great elegance. A smaller crop of excellent quality." Tasting Notes "Luminous ruby color. Wine Advocate 91 "The 2008 Chianti Classico Riserva is gorgeous, especially for a vintage that was not easy. Black cherries, mint, licorice and tobacco are supported by firm yet well-integrated tannins and lively acidity, both of which should allow the wine to age gracefully for a number of years.